I'm not a big fan of meticulous sewing. That's part of the reason why I love the modern quilting movement...it's less about precise patterns and more about creating your own design; playing with shapes and colors. I like the freedom of starting a quilt without an exact pattern and letting my whims dictate the design as I go along. That being said, I've seen some awe-inspiring traditional quilts done with a modern take (Dresden Plate, Spiderweb, etc). 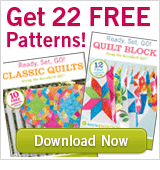 It's not that I hate the look of traditional quilt patterns. When done with modern fabrics, I find myself quite smitten by them. I think what really turns me off is the razor thin margin of error that comes with the cutting and sewing of them. It makes me nervous. And I really, really hate ripping seams. With gusto. When I make a quilt of my own design, if I screw up the cutting or sewing, I can usually find a way to hide it by veering from the original plan. But if I make a mistake while cutting or sewing fabric for a traditional pattern, everyone's going to notice because they know what it's supposed to look like. And it's not supposed to look like a wonky garbage pail quilt. But as of yesterday, I've finally given in to my fears. It took my life-long friend's upcoming wedding to finally convince me, but I'm taking the plunge. The big beast itself...the Double Wedding Ring. I've always loved the romantic idea behind this quilt (not to mention the gorgeous design), but it's quite the monster. Wish me luck as I paper piece myself into oblivion! 80 arcs. 16 rings. 1 quilter on a mission. May the best (wo)man win.